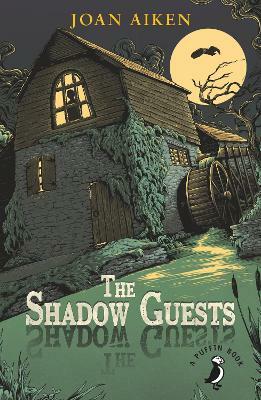 A lonely boy haunted by an ancient family curse, The Shadow Guests is a classic supernatural mystery from the master-storyteller, Joan Aiken.After the mysterious disappearance of his mother and older brother, Cosmo is sent away to live with his father's eccentric cousin, and to a... read full description below. A lonely boy haunted by an ancient family curse, The Shadow Guests is a classic supernatural mystery from the master-storyteller, Joan Aiken.After the mysterious disappearance of his mother and older brother, Cosmo is sent away to live with his father's eccentric cousin, and to a strange school where he is lost and lonely among his unfriendly classmates. Luckily he can escape at weekends to the peace of his cousin's ancient mill house, and the shadowy companions only he can see. But then he learns about the family curse, with which his visitors from the past seem to be connected. The 'shadow guests' welcome Cosmo's help, but are their increasingly menacing activities linked to his own problems? Joan Delano Aiken (1924-2004) was the daughter of the American poet, Conrad Aiken. Joan had a variety of jobs, including working for the BBC, the United Nations Information Centre and then as features editor for a short story magazine. Her first children's novel, The Kingdom of the Cave, was published in 1960. Joan Aiken wrote over a hundred books for young readers and adults and is recognized as one of the classic authors of the twentieth century. Her best-known books are those in the James III saga, of which The Wolves of Willoughby Chase was the first title, published in l962 and awarded the Lewis Carroll prize. Both that and Black Hearts in Battersea have been filmed. Her books are internationally acclaimed and she received the Edgar Allan Poe Award in the United States as well as the Guardian Award for Fiction in this country for The Whispering Mountain. In 1999 Joan Aiken was awarded an MBE for her services to children's books.